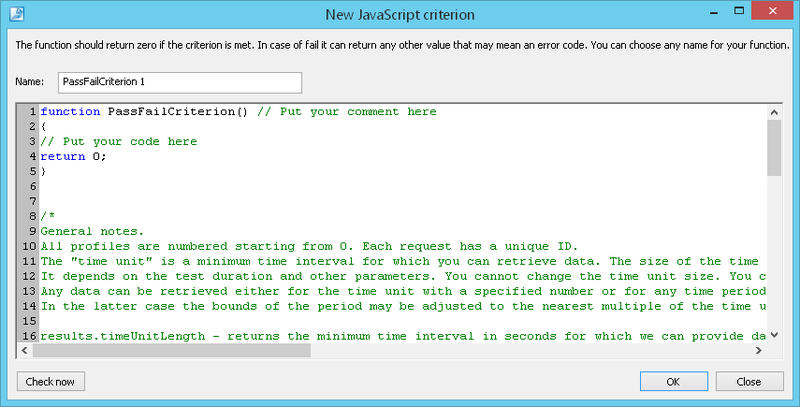 New from template: Opens a dialog for adding a new pass/fail criterion based on the template. Remove: Removes a selected criterion from the list. Edit: Opens the "Edit criterion" dialog where you can edit the selected criterion. Check and update report: Checks the current results - whether they satisfy all specified criteria or not, and updates the report. Click the New from template button to add a new pass/fail criterion based on the template. You can divide the whole test time period to any number of equal intervals. Specify the necessary number of intervals. WAPT Pro will calculate the averaged data on each interval. If you do not need to divide the test time period, specify the number 1 in this field. Select the necessary criterion in the list of predefined pass/fail criteria, for example, you can add a criterion 'Session error rate for each profile in every period should be less than 50%'. Here you can enter either an integer, or a decimal number (for example, 50.55%). The specified criterion must be fulfilled on each time interval. Exclude periods with less than _ results: If some period contains insufficient number of results (less than the specified value), it is excluded from consideration. Check now: Use this button to check the current results - whether they satisfy this criterion or not. If you need to check all criteria, use the button "Check and update report" in the list of all pass/fail criteria. results.timeUnitLength – returns the minimum time interval in seconds for which we can provide the data (time unit). results.getProfileNumber(name_key) – returns the number of profile with the name containing name_key; returns the first found result in case several results match the search condition. results.totalProfiles – the total number of profiles in the scenario. results.totalTimeUnits – the total number of the time unit intervals in the test data. results.getRequestByName(profile_num, name_key) – returns the ID of a request with the name containing the name_key; returns the first found result in case several results match the search condition. results.getIntervalValueForProfile(profile_num, from_sec, to_sec, val_spec) – returns the value of a parameter for a specified period. results.getIntervalValueForRequest(request_ID, from_sec, to_sec, val_spec) – returns the value of a parameter for a specified period. results.getTotalNumberOfRequests(profile_num) – returns the total number of requests in the profile number profile_num. results.getRequestByNumber(profile_num, request_num) – returns the ID of a request by its number. Numeration of requests within a profile starts from 0.
results.getRequestName(request_ID) – returns the name of a request. 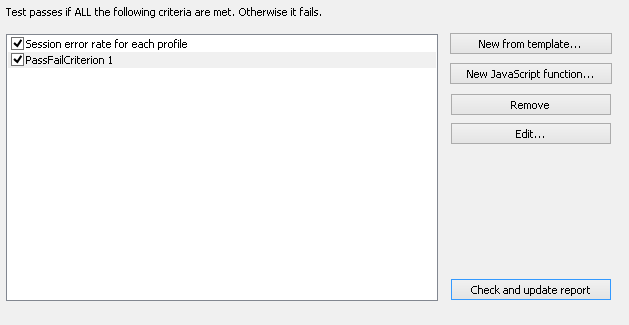 results.getProfileName(profile_num) – returns the name of a profile. results.output(message_text) – writes any text message to the custom output section attached to the generated report. Note that the function should return zero if the criterion is passed. Otherwise, if it fails, it can return any other value, e.g. the code of error. Results of passing the criteria are represented in the Pass/Fail Criteria table of the Summary report and HTML report.